Quite a few descendants of Van de Rhoer family were living in Meppel around 1940. They were either descendant of Abraham van de Rhoer or of Jacob van de Rhoer. Abraham was born at Staphorst in 1851 and married in Meppel in 1871 Matje Glazer, who was born there. This branch of the Van de Rhoer family was called ‘de Matjes’ since then. They came to live in Meppel, where they got eleven children! Simon and Rebecca died a few days after birth. Abraham died in 1932; his wife two years before him. 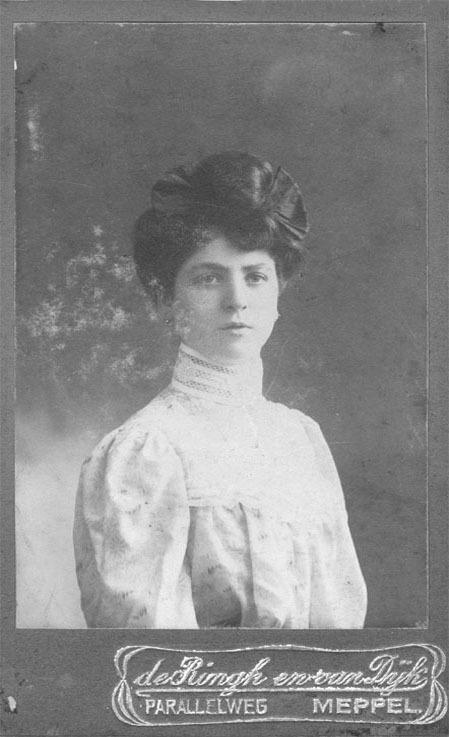 Hendrina was born in 1872 and married Isac Wolf in 1909. They had three daughters: Sara, Matje and Jeanette. Hendrina and Isac died respectively in 1934 and 1924. 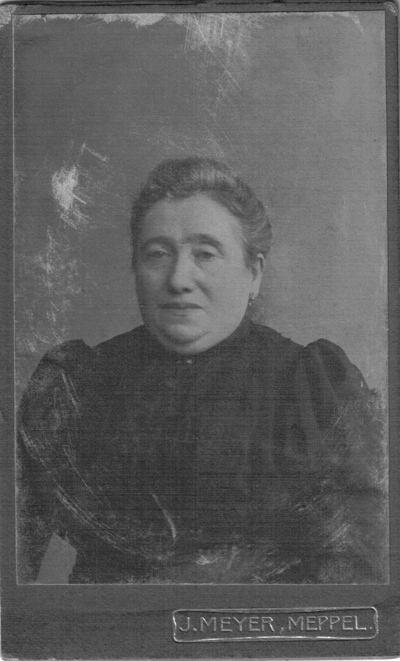 Eva, born in 1874, married Coenraad van Es. She died in 1930. They had two children, Abraham and Carolina Mathilda. Jacob, born in 1882, and Gerhard, born in 1884, left Meppel. Joël, Schoontje, Simon, Vogeltje and Mozes still lived in Meppel in the first years of WWII. Schoontje van de Rhoer, second wife of Coenraad van Es, a teacher, lived on Steenwijkerstraatweg. Vogeltje van de Rhoer (born in 1895) lived in Woldstraat. She was married to Salomon de Leeuw, who had a music shop and was also a musician. Another branch of the Van de Rhoer family descended from Jacob van de Rhoer and his wife Vogeltje Levi. 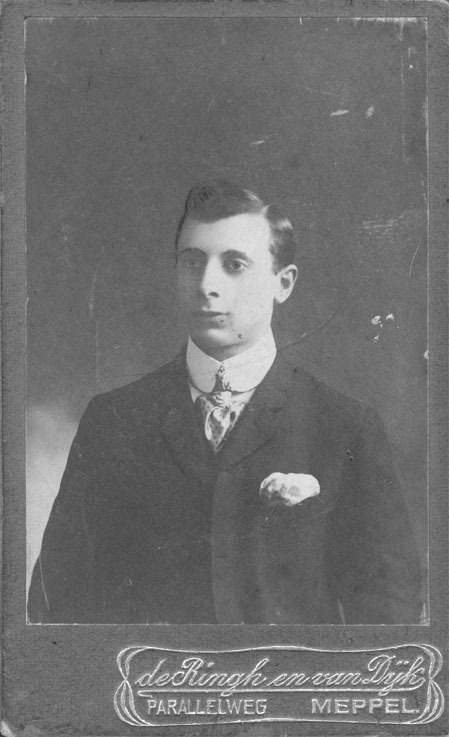 Jacob was born at Staphorst on 5 November 1894; Vogeltje in Groningen on 2 March 1852. The couple went to live at Staphorst where they got nine children. Vrouwtje (born in 1886), Saartje (1888) and Abraham (1890) did not live in Meppel during WWII. 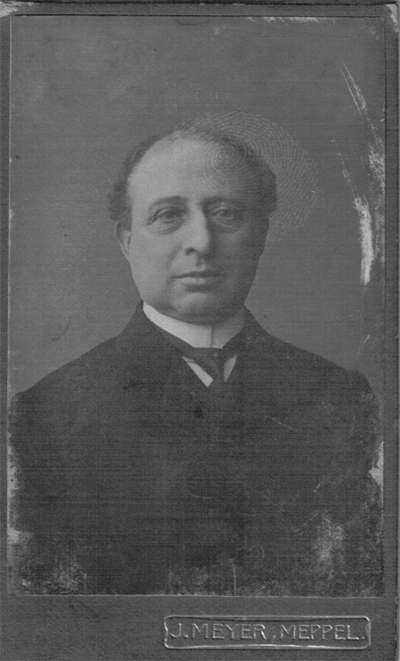 Vogeltje died as early as 1914. Joël, Bertha, Hendrina, Philippus and Levie did live in Meppel at the beginning of the war. A photograph taken in Meppel of Gerhard van de Rhoer and Regina Druijf. They were married at Zaandam. They first moved to Rotterdam and later to Breda. There Gerhard was betrayed by the woman next door when he was working in the garden without wearing his ‘star’. He was deported to Mauthausen, where he was killed on 30 October 1944. His wife Regina survived the war. Abraham van de Rhoer and his wife Matje van de Rhoer-Glazer.